President Mahinda Rajapaksa declared open the Wahalkada at the Tissamaharama Raja Maha Viharaya, which was constructed in memory of their deceased parents, father D. A. Rajapaksa and mother Dandina Samarasinghe Dissanayaka, this evening on 16 August. 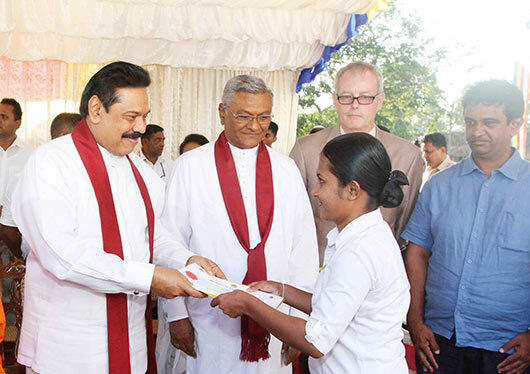 The President accompanied with Speaker Chamal Rajapaksa and Parliamentarian Namal Rajapaksa representing Rajapaksa family at the ceremony. They also engaged in performing religious observances at the Viharaya. 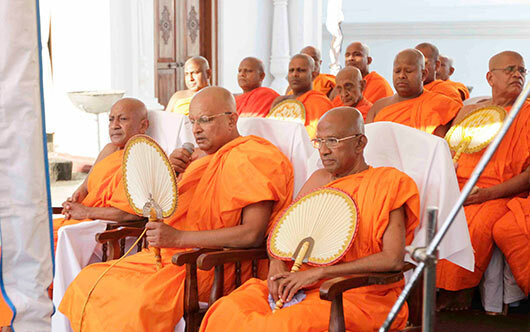 Chief Incumbent of the Viharaya, Venerable Dr. Devalegama Dhammasena Nayaka Thero bestowed blessings on the President and the Rajapaksa family and delivered the main sermon. The President has also presided over a ceremony to hand over certificates to those who have successfully completed courses at the Vocational Training Centre of the Raja Maha Viharaya. 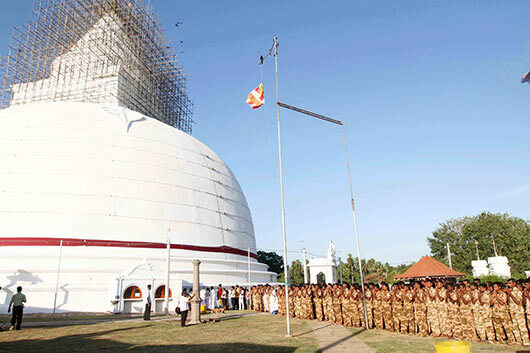 President Mahinda Rajapaksa also paid homage to Sri Sumedharama Piriven Viharaya in Nagarawewa, Tissapura in Hambantota. The President participated the ceremony as the Chief Guest to declare open the Bodhi Prakaraya, Shrine Room and Wahalkada at the Piriven Viharaya. The constructions have been carried out by the soldiers of the 12th Battalion of the Sri Lanka Army under the leadership of Brigadier Nandana Senadheera. After the religious observations Chief Incumbent of the Sri Sumedharama Piriven Viharaya, Venerable Panamure Sunanda Nayaka Thero bestowed blessings on the President. A large crowd flocked to the area to witness the both occasions. The President also had cordial discussions with the devotees and locals who visited the temples.